Elsa’s Frozen Hot Chocolate is a fantastic twist on my homemade white hot chocolate recipe that is perfect for fans of Disney’s Frozen. What is I Knead to Eat’s Hot Chocolate Extravaganza? And there’s no such thing as too many hot chocolate recipes. 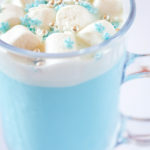 While I was thinking about all the hot chocolate recipes I would make for the blog, I knew I wanted to do a few that were colorful and playful! Unicorn Hot Chocolate – perfect for all unicorn fans!!! Creamy Homemade White Hot Chocolate that’s just the right amount of festive! We start off by making my Creamy Homemade White Hot Chocolate recipe. And that’s where the fun begins. Add a couple of drops of blue gel food color. I highly recommend using gel food colors because they’re concentrated and so help achieve a bright color without using too much food color. 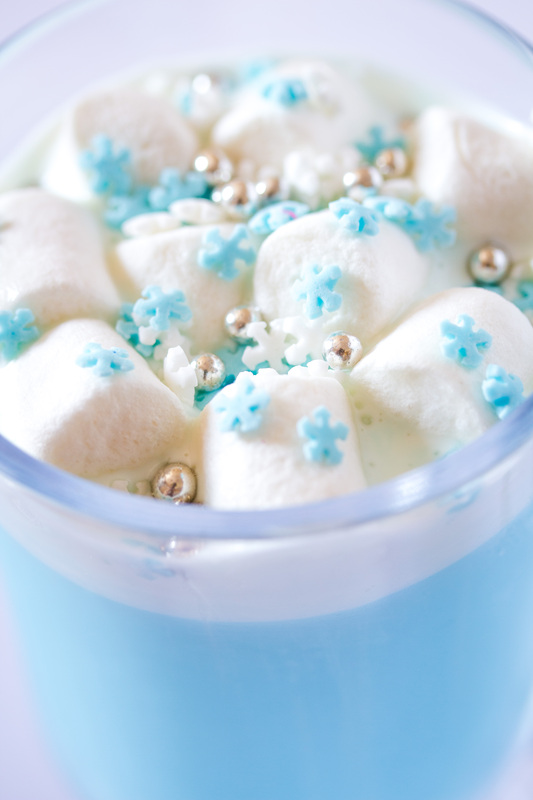 Then top with whipped cream, mini marshmallows and snowflake sprinkles. 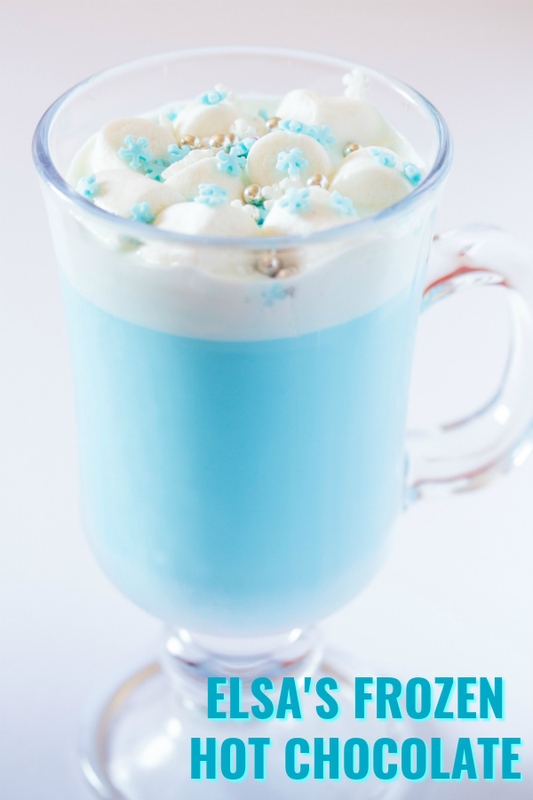 And don’t forget to watch Frozen, while sipping on this hot chocolate that’s so delicious it might just be a fantasy! 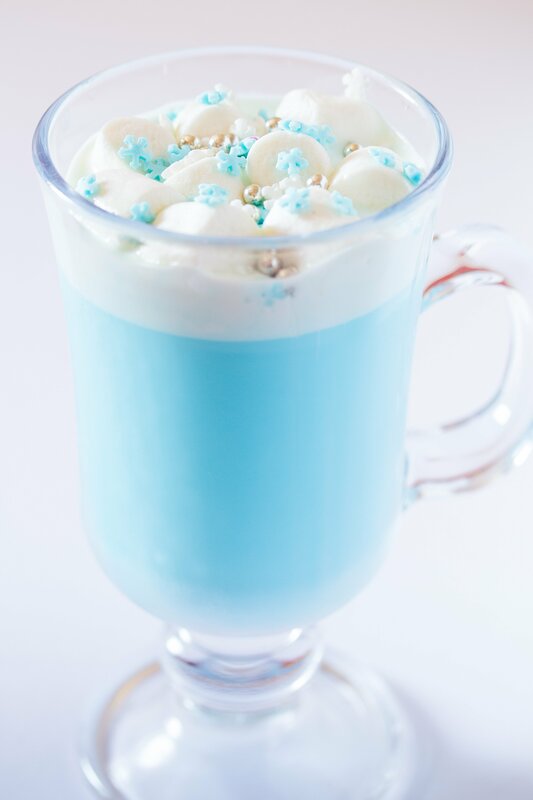 Elsa’s Frozen Hot Chocolate is fun twist on homemade white hot chocolate that is perfect for Disney’s Frozen. In a medium sized saucepan combine the milk, white hot chocolate and vanilla. Bring to a gentle simmer and continuously whisk until the white chocolate has melted completely. Add a few drops of blue gel food colouring and whisk until you reach your desired shade of blue. I only used a few drops. Remove from heat and pour into serving mugs. 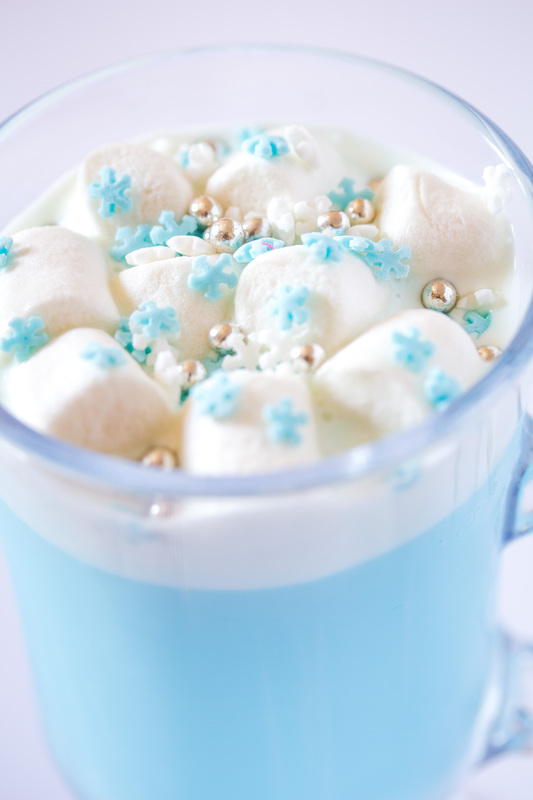 Top with mini marshmallows, blue and white sprinkles, and silver sprinkles.